I worked on the green motif a little bit more last night. I just wanted to clarify that the color changes are not mine. I have once again borrowed a conversion from my friend Katrina. She has such a great eye for color! I had a touch of startitis right before I went to Florida. I started three designs including Mary. The first was Hands to Work "Two Fine Houses." 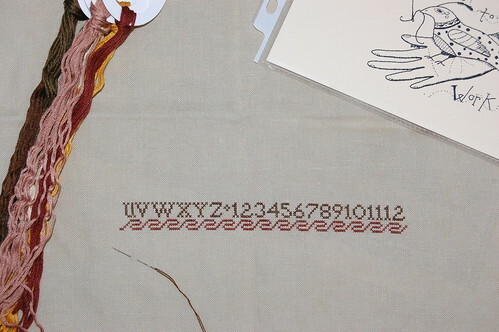 I'm stitching it on the recommended 40 ct. Pear linen by Lakeside Linens using NPI silk (1 over 2). 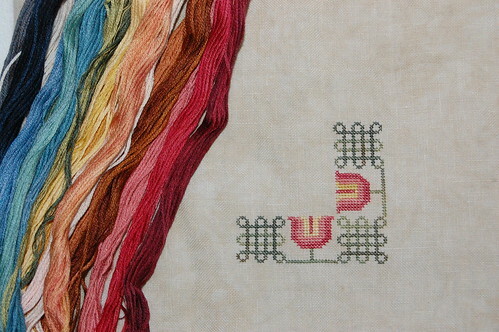 The second start was Praiseworthy Stitches "Knots and Flowers Sampler." I'm stitching this one on 40 ct. Purely Primitive by Silkweaver using GAST and Needle Necessities (1 over 2). That's it for the starts - for now at least. I'm very tempted to start Plantation Sampler with Deb. Margaret's wip pics are so pretty! The more I see the more I'm finding it hard to resist! :) Write soon! Your wips are always so lovely & inspiring to look at. Just a real pleasure to watch their progress. oh I love them all! I just bought the Knots and Flowers chart at my LNS in April -- love that one! Your startitis is dangerous to my stitching. lol! All your new starts look wonderful, I love the colors your are using for Mary Wigham, I am still thinking on mine. Wonderful starts. I love the color choice on the SAL very soft and pretty. 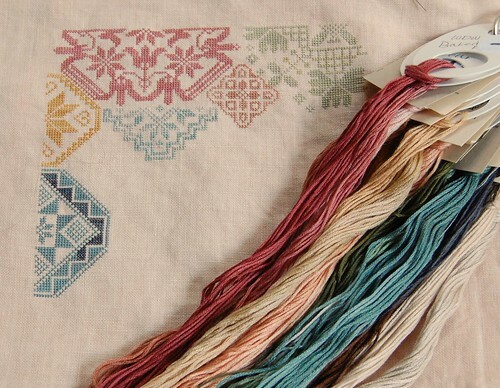 I really want ot stitch the Plantation Sampler as well it looks tempting. There's nothing like a new start, or several of them, lol! Your's are all so pretty!!! Good grief, what beautiful starts!! Very pretty starts! How on earth do you do your rotation though? For the first time since I started stitching I have more than 1 project going and I'm having trouble getting to work on all of them. Seems I pick one and then never switch to one of the others! I love your color choices for Mary, Nicole! I'm going to be so tempted to start this. And I love all your 'startitis' projects! All of them are going to be really nice. And yes, start the Plantation Sampler with me. I'm still waiting on my fabric, don't know how much I'll stitch at one time (because I still have my Shores blocks to do every month), but I would love company on this! We can blame Margaret for this - hers looks so nice. As always your progress is gorg-e-ous!!! Love those thread colors and the fabs. I love all of your new starts. I have this startitis urge, but I think I need to finish the dozen or so WIPs before I start anything new. Nicole-Startitis is a very good thing. There's nothing better than starting a new project except maybe finishing one. All look great and I love Katrina's conversion. It's beautiful, as is your stitching. Yes, it's so hard to stick with one thing these days. Too much grabbing your attention. Glad you had a safe trip down to FL. Nice progress on Mary. Those colors for MW are gorgeous! Love the new starts. I finished TFH a few years ago but now I wonder where it is, lol. Startis is running in the air right now too. Beautiful progress on Mary and pretty new starts! Can't wait to see more!!! Your new starts are wonderful, and I too love the Plantation Sampler! Just lovely, Nicole! We all benefit from your startitis. The conversion for Mary is very nice. Glad to have you safely back from your trip! Very pretty new starts. The colors on Mary are gorgeous. Don't you love all the enabling going around. Oh, man. You're making it harder to resist MW! I love Katrina's changes, and your stitching is always beautiful. Love the new starts, too! I have seen numerous MW starts and really like yours best - would you share your color choices? Another New Start - Ack! Bird in the Bower Finished!